Celery root, also called celeriac, is a very unattractive fall and winter root vegetable that can be prepared many ways. The French bistro classic celery root remoulade, a raw salad, is my favorite. I had seen celery root in the produce markets for years, but never tried it. If you've seen it, you know why! It's probably the ugliest vegetable you'll ever see, sort of like a hairy turnip with tumors. After all the ugliness is trimmed away, you're left with about three-quarters, even two-thirds, the weight you started with. Celery root remoulade is something I first made years ago after seeing Julia Child* make it on television. Of course, I made up my own recipe to suit myself; and here it is. It can be tricky to follow a recipe when celery roots come in such a wide range of sizes. Just adjust the dressing amounts to the weight of the celery root. The one I bought this week at my local health food store was only 3/4 pound, and there was just the one. After all the strange stuff was trimmed away, it was down to 1/2 pound, just right for two people. If you've been passing over celery root just because of its appearance, as I did for so long (I feel so shallow! ), quickly pop one or two in a bag next shopping trip. You'll be sorry you didn't give the odd little things a chance sooner! 1 Cut off the leaves and root end, then scrub. Trim, peel and halve lengthwise the celery root. Cut each half lengthwise into 2 or more pieces, whatever will fit into the feed tube of your food processor. With shredding disk in place, coarsely shred the celery root. 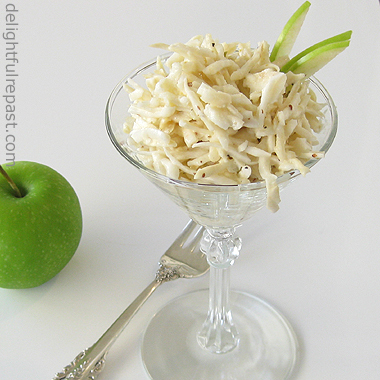 In 1-quart bowl, toss the shredded celery root with salt and 1 tablespoon of the lemon juice. Cover and set aside to soften for 30 to 60 minutes. 2 In small bowl, stir together remaining ingredients. Stir the dressing into the celery root and mix well. Taste and adjust the seasoning. Cover and refrigerate for 2 hours or up to 2 days. 3 Spoon each serving into a small bowl or on a small leaf of butter lettuce on a plate. Garnish. * See Vegetable Quiche post for one of my Julia Child stories. Jean, you could make a pinto bean look gorgeous, exotic, and appealing! What a beautiful photo. And who would have known that could be so delicious! Thanks, JavelinWarrior! I hope lots of people will be inspired to give celery root a try. Adventurous coleslaw - I like that! A lot. I do believe you'd like this then. About the tomatoes - I haven't found one with personality in months! Need to grow some next year. This sounds really good. A nice twist on the standard coleslaw for sure! Jenn, thank you! I do love a nice tangy coleslaw, but this is something a little different. You can pretty much count on it being a "first" for most of the people you serve it to. Silk purse out of a sow's ear... haha! It's true though. It looks like some sort of wrinkled, diseased turnip or something. I love celery (and celeriac too) so it's always fun to see recipes using it because it's not that common it seems. I've never made (or tried) a remoulade - this sounds really fresh and delicious... capers and lemon juice... mmmm! definitely putting this on my list to try next week-who knows, it might even get on the Thanksgiving menu! Thanks for the great recipe!! Thanks, Pamela! Actually, it does go perfectly with the traditional Thanksgiving menu. This looks awesome. hope you don't mind it if I borrow it and freestyle it a bit? I think this would go most excellent with some venison saddle I was thinking of curing and cold smoking. Mike, I'm so glad you like it! Feel free to freestyle it to go with your cold smoked venison.